The research on this subject seems inconclusive and ebbs and flows like the tide at Redcar.It leaves me to resort to personal anecdotal evidence. 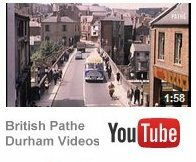 I recall that New Brancepeth and Ushaw Moor were polite places in which to live back in the 1950s. There was the occasional drunk and truculent coal-miner, but that is utterly acceptable to me when I consider their working conditions at that time. All the shop assistants were polite, tidy and with clean hands.There were a few dysfunctional and troublesome families, but you get that all over the place and in all classes of society. I would probably award the 1950s star team prize to the assistants at Broughs grocery store in Ushaw Moor or possibly those at the Co-Op store in New Brancepeth, but no doubt you have your own favourites. I came across my favourite shop assistant of all time in Durham City back in 2002; I was seeking a raincoat without the aid and guidance of my good wife [circumstances that allegedly leave me helpless] and the female assistant could not have been more helpful. My worst experience was at the Consett Employment Office in about 1969. I recall filling out a form and eventually receiving five shillings from a young female with the demeanour of someone reluctantly paying me out of her own pocket. Little did I know it then but four years later I worked for the DHSS, albeit at a higher grade, and displayed understanding and empathy beyond that young worker’s capabilities, unless she subsequently grew up. I have two booby prizes to hand out for insensitive customer service but neither of them to people from New Brancepeth or Ushaw Moor. I will not bore you with details, but a young grocery store assistant employed by a firm called One Stop and a female worker representing the Allianz Insurance firm are the recipients. It might be that they were merely having a bad day so I forgive them and intend to use those companies again!